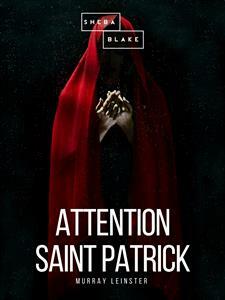 In "Attention Saint Patrick," American science fiction writer Murray Leinster cleverly transposes aspects of Irish myth and legend into an intergalactic setting. The inhabitants of a planet known as Eire are battling an infestation of strange creatures known as dinies with an insatiable appetite for infrastructure. Will the far-fetched solution posed by an earthling name Moira solve the problem? Murray Leinster (June 16, 1896 – June 8, 1975) was a nom de plume of William Fitzgerald Jenkins, an American writer of science fiction and alternate history literature. He wrote and published more than 1,500 short stories and articles, 14 movie scripts, and hundreds of radio scripts and television plays. Copyright © 2018 by Murray Leinster. Legends do, of course, get somewhat distorted in the passage of time. President O'Hanrahan of the planetary government of Eire listened unhappily to his official guest. He had to, because Sean O'Donohue was chairman of the Dail--of Eire on Earth--Committee on the Condition of the Planet Eire. He could cut off all support from the still-struggling colony if he chose. He was short and opinionated, he had sharp, gimlet eyes, he had bristling white hair that once had been red, and he was the grandfather of Moira O'Donohue, who'd traveled to Eire with him on a very uncomfortable spaceship. That last was a mark in his favor, but now he stood four-square upon the sagging porch of the presidential mansion of Eire, and laid down the law. "I've been here three days." he told the president sternly, while his granddaughter looked sympathetic, "and I'm of the opinion that there's been shenanigans goin' on to keep this fine world from becoming' what it was meant for--a place for the people of Eire on Earth to emigrate to when there was more of them than Erin has room for. Which is now!" "We've had difficulties----" began the president uneasily. "This world should be ready!" snapped Sean O'Donohue accusingly. "It should be waitin' for the Caseys and Bradys and Fitzpatricks and other fine Erse people to move to and thrive on while the rest of the galaxy goes to pot with its new-fangled notions. That's the reason for this world's very existence. What set aside Erin on Earth, where our ancestors lived an' where their descendants are breathin' down each other's necks because there's so many of them? There was no snakes there! St. Patrick drove them out. What sets this world apart from all the other livable planets men have put down their smelly spaceships on? There's no snakes here! St. Patrick has great influence up in Heaven. He knew his fine Erse people would presently need more room than there was on Earth for them. So he'd a world set aside, and marked by the sign that no least trace of a serpent could exist on it. No creature like the one that blarneyed Mother Eve could be here! No----"
"Our trouble's been dinies," began the president apologetically. But he froze. Something dark and sinuous and complacent oozed around the corner of the presidential mansion. The president of Eire sweated. He recognized the dark object. He'd believed it safely put away in pleasant confinement until the Dail Committee went away. But it wasn't. It was Timothy, the amiable six-foot black snake who faithfully and cordially did his best to keep the presidential mansion from falling down. Without him innumerable mouse-sized holes, gnawed by mouse-sized dinies, would assuredly have brought about its collapse. The president was grateful, but he'd meant to keep Timothy out of sight. Timothy must have escaped and as a faithful snake, loyal to his duty, he'd wriggled straight back to the presidential mansion. Like all Eire, he undoubtedly knew of the pious tradition that St. Patrick had brought the snakes to Eire, and he wasn't one to let St. Patrick down. So he'd returned and doubtless patrolled all the diny tunnels in the sagging structure. He'd cleaned out any miniature, dinosaurlike creatures who might be planning to eat some more nails. He now prepared to nap, with a clear conscience. But if Sean O'Donohue saw him--! Perspiration stood out on President O'Hanrahan's forehead. The droplets joined and ran down his nose.